The summer programs at our local libraries have been absolutely amazing this summer. I could not imagine what we would do if we did not have them to go to. While at the chocolate tasting experience, the librarian mentioned another event coming up. 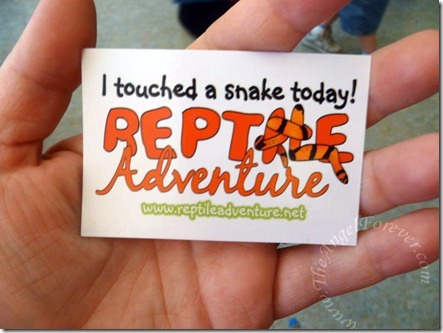 It was going to be Reptile Adventure with Jessica Shea. 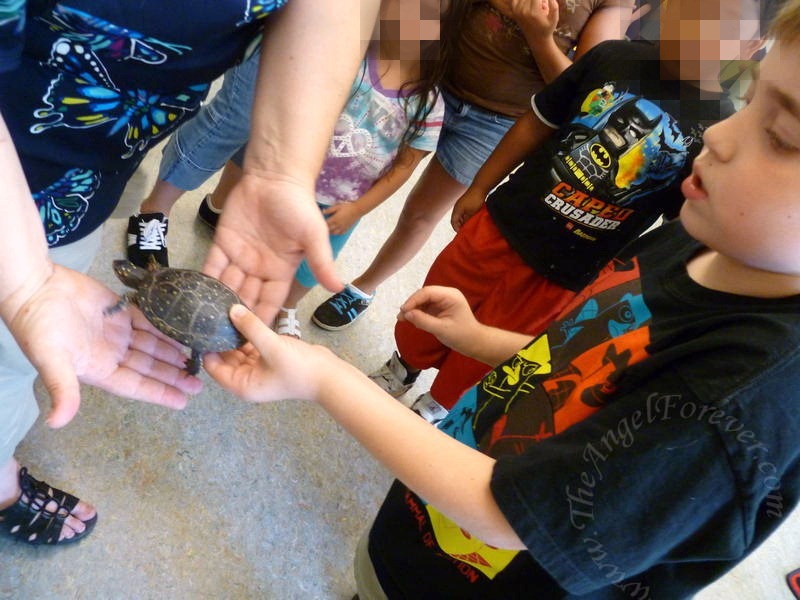 The description was “Touch a snake, pet a turtle, and see eye-to-eye with a South American frog.” Yes, Reptile Adventure was coming to help the kids learn and meet some of their friends. NHL was very excited about the program, but JSL opted not to go. He was tired and stayed back with Papa to rest and relax. I thought this was an amazing opportunity to introduce the kids to the wonders of reptiles. 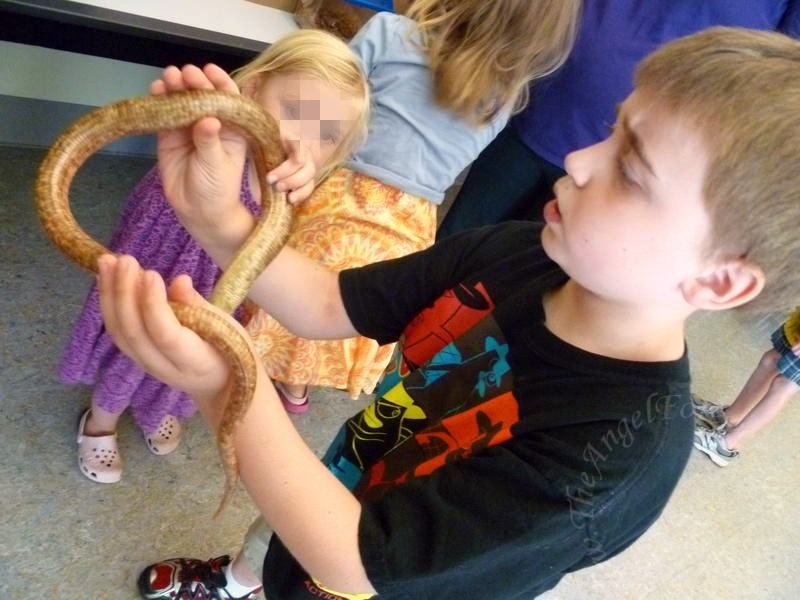 I still remember meeting several snakes and other critters during a Girl Scout event when I was a child. 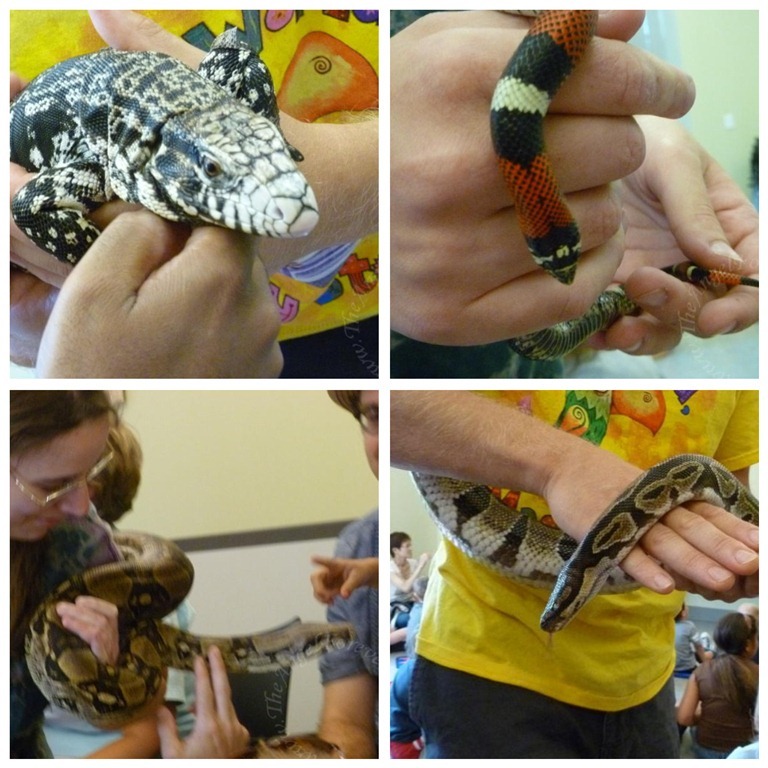 When NHL and I walked into the meeting room, there were several reptiles already out to greet the excited children. One of them was Plaid. True story, NHL walked right by Plaid and did not notice him sitting there until he nearly bumped into him and it scared him. It was definitely a kodak moment since I had watched the entire event (wish I had my video camera turned on). Then, we went to wait on line to hold the Python. 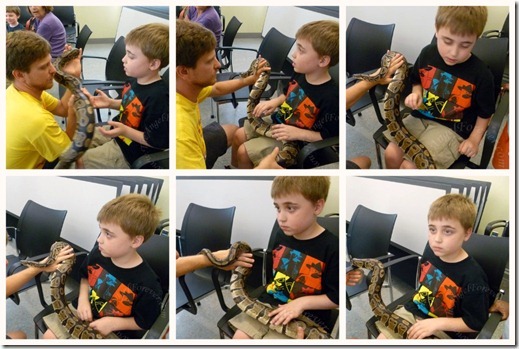 NHL was not too sure about this, but he allowed the Python on his lap and was petting it while chatting away about snakes. A special thanks for the patience of Chris from the library. He was a rock star handling the reptiles and helping with the kids. Yes, this truly was a FUN and EDUCATIONAL experience for everyone that was there. When it was time to go, Jessica told the kids to each take a special sticker. NHL did and was so proud to show it to others the rest of the afternoon. 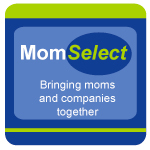 Thanks to the library, we now know about another great business that helps to educate children in our area and may be a fantastic future birthday party experience. Can you imagine?! What reptile would you love to know/learn more about and why? Oh and no saying you don’t like them – you probably have never met any like these to appreciate them. 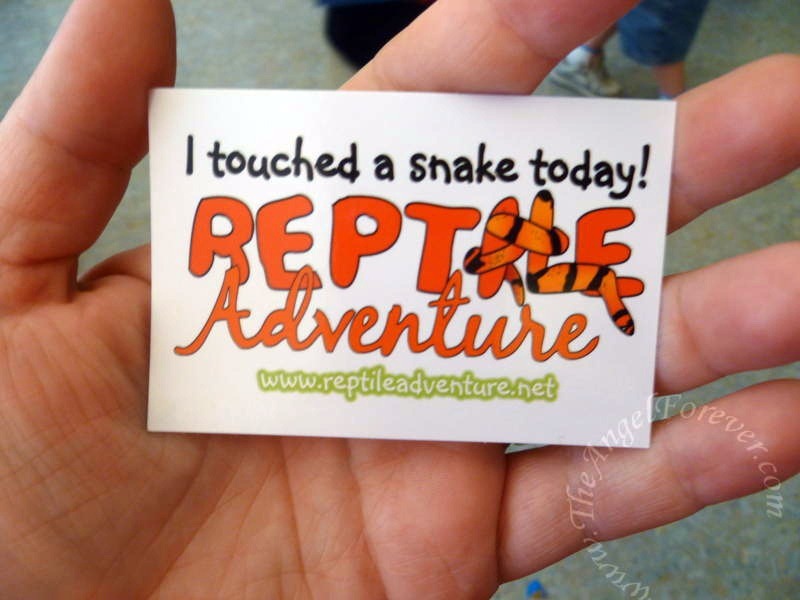 I wish there was a Reptile Adventure here! One of the items on my bucket list is “Handle A Snake” because I am soooo afraid of them! I’ve already accomplished one: a bird. Besides a snake, I only have one more animal: a rat. Hope your Friday is fantastic! My eldest handled a python from a snake charmer when we were visiting Sentosa a few months back.. I personally wouldn’t try. Good on your son to be so sporting. I would like to learn more about Komodo Dragons as they look so cool and awesome. I cannot think of any reptile I would want to be around, LOL! I’m totally creeped out by snakes and lizards and turtles. NONE…They just creep my out looking at them. However, my daughter loves snakes. Is a frog considered one. We have some White Bull frogs living around our pool. They are pretty friendly. We have even named them. when we swim in the evenings they are around the pool watching us. It is really strange, back in a way funny to see them. They are completely white with green eyes. Loved to be splashed. 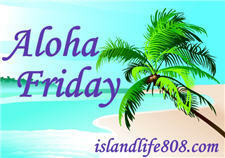 Aloha: Back to School Shopping – Let the Foraging Begin! The black and white spotted lizard is a tegu. The red/white/black striped snake is a tricolor hognose. You are highly unlikely to see the tricolor hognose anywhere else; they’re pretty uncommon in the pet trade (and crazy expensive). For Auntie E: Frogs are amphibians, but we often bring at least one frog to programs so we can talk about the differences. With my luck, I’d touch one and catch salmonella or something. Your kids are more brave than I am. 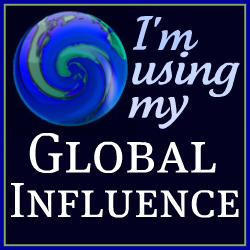 Hope to see you at BlogHer! It’s so cool to see you guys having so much fun with these but gosh I shivered too. Anyway I’d love my kids to be up close and personal with something like this to learn more about them. Because we have snakes in our yard and I’m afraid of them. I’d like to learn more about them. Nope sorry, uh-huh, not me, ain’t no way! Well, maybe a turtle, but that’s as far as I go! ewwwwwwwwwww Have a great weekend. That is really awesome! I love reptiles…but not such a snake fan. Something about the way their muscles contract doesn’t go over well with me. 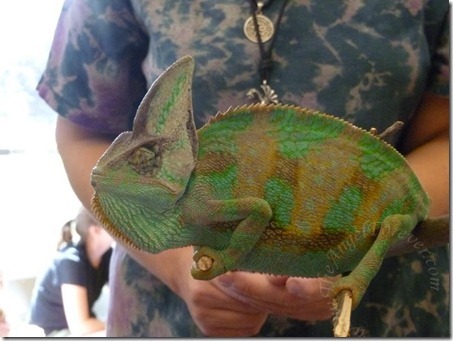 I would love to interact with more chameleons or uromastyxes…they are so coool! I’m so glad I have girls who have no interest in reptiles! LOL! Btw, I heard that Techy Dad wants an iPad2 for his birthday! LOL!